>Degrees that is! That is the gist of my fb status from last night, here is the actual status – 71 degrees today in B’ham to 17 degrees in Aspen #insanity but #goodtimes ahead with @TuskegeeU friends!! I know we will have a good time, but I was too through by the time we finally made it to Aspen, CO last night @ 11 PM CST. We left B’ham @ 3:20, arrived in Denver around 5:20 or so MDT only to find out that we were in store for a 4 hour drive to Aspen – WTF?! Talk about 38 HOT, but what could I do?! Not a damn thing, but just ride around in the back seat of a rental car like Miss Daisy, while Mister and his line brother talked about any and everything!! I left a message on fb for one of our other friends that was ahead of us arriving and told her to have me a drink ready when we finally arrived. Good times are indeed in store! More to come…. 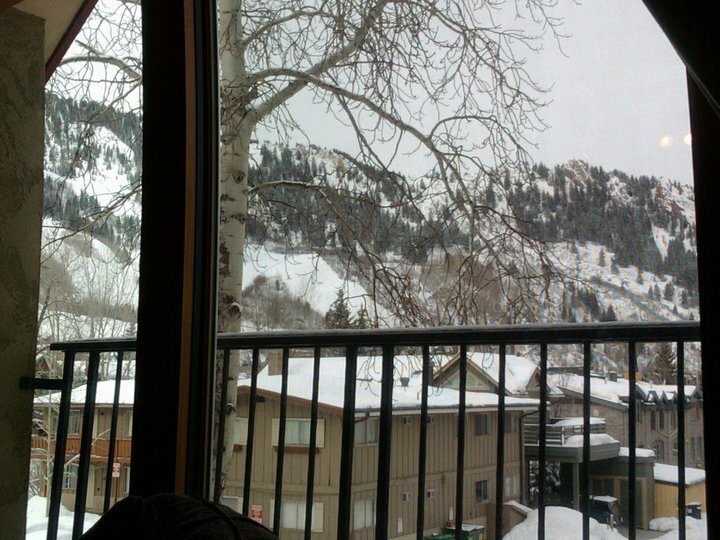 My view this morning in Aspen! This entry was posted in Aspen, Ski Trip. Bookmark the permalink.